Spring Magic by D.E. Stevenson was first published in 1942 but I read a 1986 reprint which had to be hauled out of Fife Libraries’ reserve stock. I’m only thankful that they haven’t got rid of the books completely, as they have with so many other authors. I’m not close to having read all of D.E. 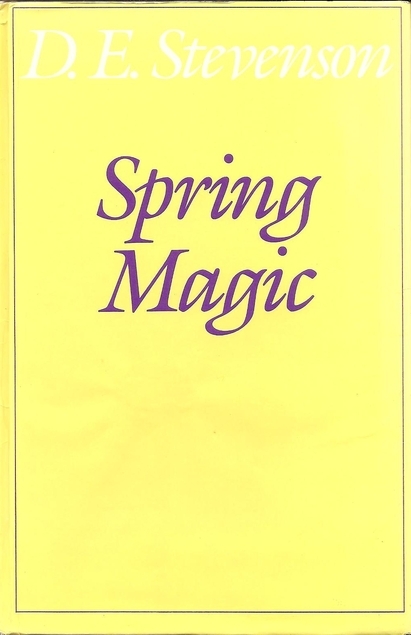 Stevenson’s books but so far Spring Magic is my favourite. The setting is mainly Scotland and during World War 2. I’m very partial to wartime books especially when they are contemporary. Frances Field is living in London with her aunt and uncle, she has been with them for years as her parents died when she was quite young. Her aunt is a very silly selfish woman and she believes that Frances is there to pander to her every wish. The aunt is a hypochondriac and Frances had been very sorry for her, but when the doctor tells Frances that there’s nothing wrong with her aunt and urges Frances to get out and get a life for herself, she does just that, taking the aunt’s decision to decamp out of London to a supposedly safer location as her cue to have a holiday in Scotland and think about her future. The island fishing village that Frances finds herself in is sleepy and friendly but it isn’t long before the whole area is inundated with a battalion of soldiers from the British army, changing everything, especially as some of the officers’ wives have arrived too. Frances has never really had any women friends her own age before and it opens up a whole new world for her. Not everything is sweetness and light as Frances realises along with everyone else that one of the wives is in an abusive marriage, but nothing can be done about it. Aerial dogfights and air raids bring the war right to her door and there are misunderstandings but as you would expect – all’s well in the end. This entry was posted in Books and tagged D E Stevenson, romance, Scottish author, Scottish setting, Spring Magic, World War 2 setting by Katrina. Bookmark the permalink. Ah, the library’s “reserve stock” – I’m sure most of the books there would be ones I want to read, but I can only ask for the titles I know about. It’s a shame so many good books are removed to make way for… not so good ones! I’ve just had a look at Fife Libraries catalogue, hoping that if I put ‘reserve stock’ into the search box that the contents of the reserve stock might pop up but – no such luck. So you’re correct, if we don’t know what’s in there we can’t ask for them – how annoying! At the moment I’m particularly annoyed that they don’t have all of Ludovic Kennedy’s books. I’ve read a few of D.E. Stevenson’s books, but not this one yet. I also love World War 2 settings, so I’ll look forward to reading this one eventually, especially as you say it’s your favourite so far. It’s bizarre that I find a wartime setting so comforting somehow. I hope you enjoy it too when you get around to it.